Throughout my numerous readings of The Lord of the Rings over the years, I have never ceased to be amazed, astounded, and amused at the way the characters burst into song at the drop of a hat. Seriously, think about it for a minute. You’re sitting down with your well-loved copy of LOTR in your hands, curled up in a comfy chair with your mug of hot chocolate (or tea or coffee or whatever else you enjoy) beside you. You open the book and what’s the very first thing you see…? A song. And what do we see after that? Bilbo sings “The Road Goes Ever On.” The hobbits sing as they trek across the Shire. Pippin sings a bathing song. Tom Bombadil sings (rhyming, no less!) so much, no one can get him to be quiet. The elves sing pretty much constantly. Aragorn shows a penchant for spontaneously singing historical (and often depressing) lays. Frodo and Sam sing and recite poetry often. The Ents and the Rohirrim sing before, during and after battle, giving a haunting voice to their sorrows, battle joy, and victories. Gondorians spout verse like veritable fountains of literature. Much of this was, sadly, left out of the movies. But if you read the book, you suddenly realize that there are songs everywhere. The profusion is almost frightening. But out of all the singers in the books, the most striking are, as usual, our dear friends the hobbits. Bilbo Baggins writes copious amounts of verse, we are told. He sings much of the time, and recites poetry more often than his friends and relations would like, though they don’t fault him for it. 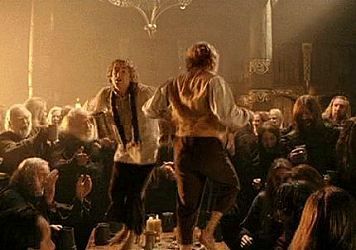 The younger hobbits also sing quite frequently, though apart from Frodo, they don’t sing the same type of songs as Bilbo. Certainly this is a far cry from his song about the ill-fated Tom. It’s easy to see that between Bilbo’s instruction and the elves’ examples, Sam has had much practice in creating his own songs and poems for various situations. His old Gaffer would be proud. The elves, of course, are famous for their unearthly voices and painfully beautiful music. Aragorn learned much of it as he grew up, and became adept at translating the elvish lyrics as accurately as possible into the Common Speech—luckily for the hobbits. The dwarves have their own songs, as powerfully elemental as the elves’ are ethereal. Bilbo is bewitched by one of their songs, and it’s one of the main reasons he heads off with them to the Lonely Mountain. That song can be heard in the first hobbit movie, and I haven’t met a person yet who doesn’t get the chills and feel a stirring in the depths of their spirits when they first hear it. Music definitely has a power unlike any other, and a way of worming itself into our heads and hearts, sometimes rather uncomfortably at first, but—as dear old Bilbo discovered—always worthwhile. It makes me sad that people now don’t sing much. It used to be much more like what we see in Middle-earth: people sang while they worked, people sang while they played, people sang for no particular reason at all, except for the fact that they felt like singing. Music connects with people on a very deep level, and it’s so satisfying to play an instrument or sing. But nowadays, most people don’t play or sing at all, or if they did it was only as a child, or when alone in the shower. Why is this? Well, the hobbits don’t care if their voices are good or bad. This gives them so much freedom to sing, a freedom we no longer have because from a very early age and for a very long time, everyone in our society has been taught that people have either “good” or “bad” voices, that very few people actually have “good” voices, and that only those with “good” voices should feel comfortable singing. Also, we have abandoned, and mostly forgotten, the old songs that our ancestors used to sing. This is a tragic occurrence, and I’m trying to rectify it in little ways. I’m memorizing old Irish and English folk songs, and I’ve come to the happy realization that not only are they immensely satisfying to sing, but they also have much more character than our modern songs. They have meaning and spirit. There is a story behind each one, and their simple tunes have more power than a thousand popular studio-enhanced songs from today’s artists. So, I’m asking you to join me in my musical adventure. I may not have what would be considered a “good” voice, but by golly I’m going to sing anyway! I want you to do the same. Join me in the effort to become like Tom Bombadil, who was practically a nonstop, walking musical. Let’s sing about ourselves, let’s sing about the woods, let’s sing about our schoolwork and the stars and the river and our best friends and the food we had for lunch. Let’s all fill our lives back up with music and joy, like they used to be. Let’s bring back the childlike spontaneity we used to have. Sing to each other and sing with each other. Like Tolkien and his characters understood, there’s a song inside all of us, completely unique and individually beautiful. All we have to do is let it out. I loved your article! I never noticed how many times the Lord of the Rings characters sang, and their variety from dirges to epics to just plain ditties! It’s too bad there wasn’t very much singing in the movies, but the Misty Mountains is pretty epic. Hey, Stormy Nights! Thank you for this insightful post on the many musical interludes within the Lord of the Rings, books and movies. Tolkien seems like he definitely had a flare for the poetic, and drew from the Norse-Anglo-Celtic folk song tradition for inspiration. As a folk song buff myself, I definitely agree with you about the importance of reclaiming that meaning and spirit that was coursing through these early ballads, and bringing singing back into our daily life as a way of connecting with one another through our common humanity, as boundless as the imagination.